A quick one tonight. I was messing about with my awesome little GoPro camera a few days ago and came up with a short time lapse video of my journey to and from work in my trusty Vauxhall Insignia. I propped up my tripod between the front headrests and sat the Hero 5 Black on the tripod plate to ready itself for action. The 30 minute round trip was recorded in 1080p, capturing a photograph every 2 seconds - an approximate total of 800. 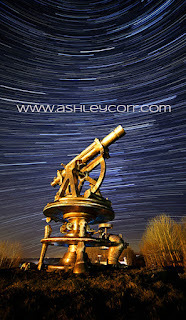 The time lapse video was assembled in camera, which was great as it meant I had no post processing to do. All I had to do was import the 2 video's and add some opening titles, end credits and a soundtrack. Very impressed with the final result. I think I'm going to have lots of fun with this little camera. Stay tuned for more video's in high definition and maybe the odd 4k production thrown in for good measure. 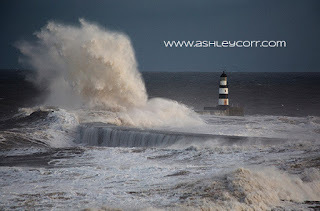 Welcome to another blog entry form the Roaming Mackem Photographer. Today I'm gonna cover another outing with my camera - a recent visit to Dunstanburgh Castle, on a stunning stretch of coatline in Northumberland. 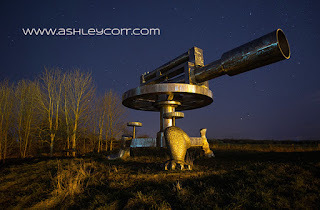 The location is just over an hours drive from my home in Houghton le Spring, so that would give me time to wake up properly after a 5.15am alarm call after a night on the lager. I didn't have much of a hangover, to be honest, and nowt that a McDonald's breakfast wouldn't fettle. So a wash and a quick cup of coffee was in order, before hoying my gear into the car and heading out. The camera bag was organised and ready the night before, and all batteries fully charged. Nowt left to do but pick my brother up and head north out of God's Country. It was 6.15am and we were on the A1(M) - a straight road to our turn off, one hour up the road. On arrival we dropped anchor near Dunstanburgh Steads, a small holding with surrounding houses, just south of Embleton. A dirt track reaches a dead end near a golf course, so we dropped anchor and I changed into wellies for the assault across Death Rocks and the outgoing tide. Another car pulled in next to us. A guy got out and we greeted each other with the obligatory 'Good Morning' salute. He saw me with my wellies on and asked if it was muddy where we were heading. I told him it was going to be very wet, hence the footwear, and he just laughed. I asked him if he was here to take photographs, which he was. I then asked if travelled far. He replied 'I'm from MANSFIELD' !!! 'Bloody hell' I replied ... 'You're keen aren't ya'. He then said he hadn't travelled from there, he was staying nearby for a few days. Oh well, that makes more sense, ha ha. After a ten minute walk across the golf course we headed down towards the sea, which was rolling in quite aggressively. 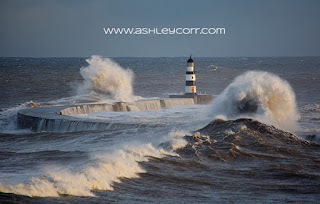 Quite big waves were crashing in, which was a reminder that what was about to unfold was going to be no walk in the walk. This brings me nicely on to the title of this blog entry. Twitching, eh. Oh, he's gone out to look at sea birds through his binoculars, you said. Gulls, cormorants and Shags, you said. Ticking them off on a nerdy tick list with his little pencil, you said. Oh no, not in the slightest. You see folks, when I say 'Twitching' I refer to the actions of my arse. Yes, ya know when you're shitting bricks and sweating profusely at your actions? Well, that's what I'm talking about. This was nee chilled out stroll along the beach, whistling merrily with a smile on my face. It was more akin to walking across slippery rocks like Bambi on ice. Oh yes, I wish I could see myself. Is that really me? In my defence I hasted to add, these rocks aint called DEATH ROCKS for nowt. No doubt I was following in the footsteps of many a tog. I remember a fellow tog called Terry Cavner (from Blyth) being airlifted off the rocks by a rescue chopper, when he fell and broke a leg. Hopefully I wasn't about to do a 'Terry' me'sel! I was in position on the rocks around 30 minutes before sunrise. As the tide retreated I found myself moving further out with it, as I wanted to catch some water movement when the sun finally showed up. A couple of other togs joined us, pitching nearby and both waiting for some nice colour in the sky. 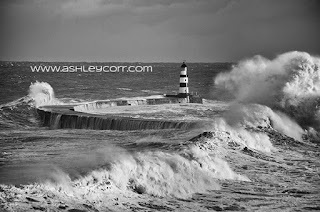 Just then a freak wave crashed in and around us, spilling over my welly tops and giving my feet a nice north sea welcome. The tripod stayed upright ... just! One of the blokes lost his tripod bag. I noticed it floating away with the receding tide. Unlucky eh. I was lucky myself. My camera bag was sat on a nearby rock when that wave came in. I managed to lift it up at the last second to avoid the wave. Now, that would have been messy ... and expensive! Get the bloody bag on your back, I told myself. Can't be dealing with another wave like that. Oh yes, me arse was twitching again. Bloody mad. The things ya do for a decent shot. Well that put paid to me pushing the envelope. I wasn't gonna move out with the tide, I was staying put - water movement or not. Guess I'll just settle for some rocky foreground and hope for some colour in the sky. A few minutes later a hint of red showed up amongst the clouds behind the castle. That'll do nicely. A few minutes later there were nice red ripples spreading out, offering a great backdrop. Time to start shooting that scene in front of me. I was cold and very wet from the waist down, but what the hell, eh. Par for the course, I told myself, in a consoling way. 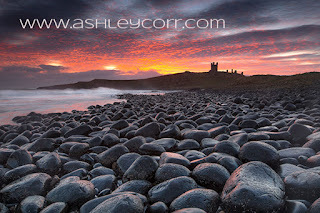 In a flash the colourful sky had diminished and the sun was up behind Dunstanburgh Castle. 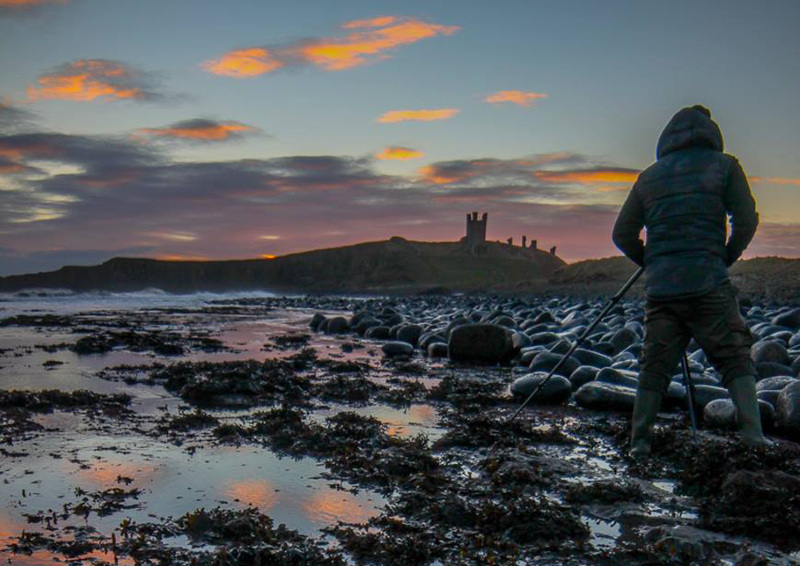 By this time I had my shot in the bag, so it was another job done - time to get off those ghastly rocks. Bye bye, see you again soon ...NOT! Terris Novalis in Consett was sculpted by Tony Cragg and won the Turner Prize. 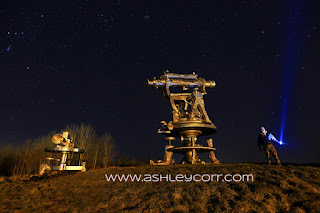 The sculpture is 20 foot (6 metres) high and is made entirely of stainless steel; it is 20 times the size of the actual surveying instruments. 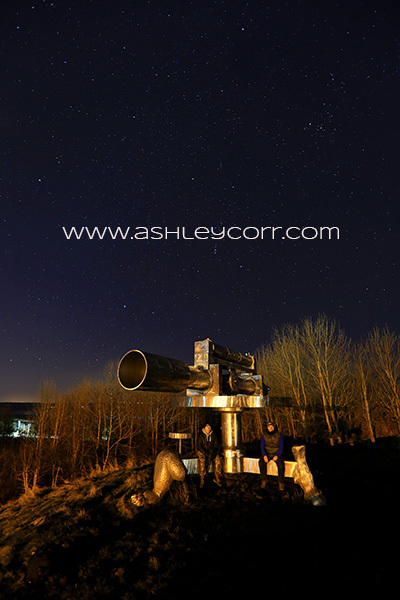 The sculpture symbolises the economic regeneration of the Consett area. 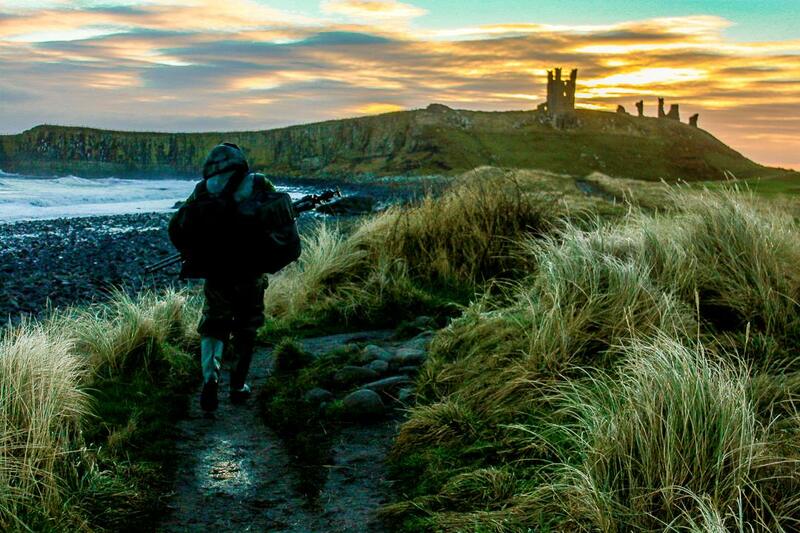 It can be found on the Coast to Coast cycle route. 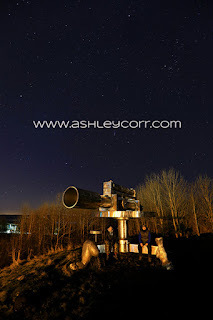 Late December 2016, a combined visit to Weardale, ending with a stop off at Consett to photograph the starry sky above Terris Novalis, which is situated just outside the town centre. 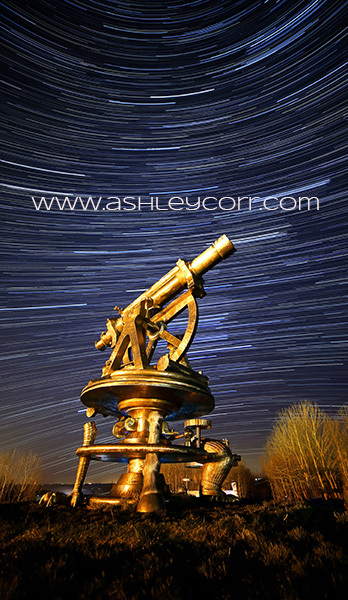 As you'd probably gather, dark night skies and built up areas aren't a good combo, especially when you're relying on as little light pollution as possible to make those little sparkly things look as prominent as poss. On this occasion I made the most of what was in front of me, which is all you can do as a photographer, so the final position of the camera was vital in pulling in some acceptable results. 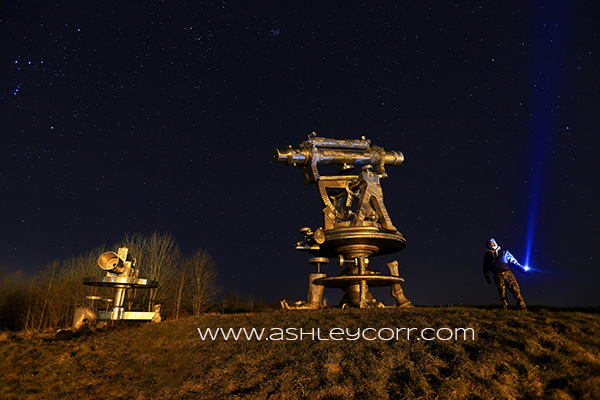 The actual sculptures are positioned perfectly for astro photography, it has to be said. The most photogenic angle has street lighting to my back and fields in front, without surrounding light. Perfecto! Nowt to do but stand around getting colder. I had my brother Chris along with me, doing pretty much the same thing, so company was at hand, which is a godsend when you're standing there twiddling the owld thumbs. Ten minutes in and two young girls, no older than 15, came waltzing by, supping blue WKD. They plonked there arses on one of the sculptures and sat there for a good hour. Typical eh. Then their mobile phones came out and they were waving them about in front of the camera, giggling their arses off. Looks like I 'll have to stop the camera, eh!!!!! One of them asked if I was taking photo's - I felt like replying "Why Like, are you taking the piss"
Anyway, when they buggered off and we regained our territory, the camera had been running for an hour or so. Time to switch off and head to Consett main street for a bit of scran. Tonights supper - Kebab meat and chips, with garlic sauce and EXTRA CHILLI. Now, this gear warmed the cockles alright. Oh yes, this was hot stuff and I just knew instantly that me jaxey would resemble the Japanese flag the next morning. But hey, the scran was rather damn tasty to say the least, so let's forget about tomorrow morning's nuclear 'Fall out' eh. Just savour the flavour. Delicious!!! These road trips with the camera always involve a takeaway at some point, and why not, it's a nice way to round the night off before heading home to put the feet up and pour a glass of cold lager down me Gregory Peck. There is every need to over indulge, and why not - it is Christmas after all! It wasn't long before I was dropping Chris off at his place then heading back along the A690 to AC Towers. That tin of lager was calling out my name and it time to put it out its misery. Tonight was a good one, very productive in more ways than one. It won't be too long before I'm back to work, so best enjoy what's left of the Christmas break by planning some more nights out with Mr Canon. The show aint over yet. January can wait, for the time being at least.